An infrastructural question: Will seaside boardwalks survive the 21st century? A look at the New York region suggests that they might not. The resurgence of nature over urban artifice during last year’s Hurricane Sandy revealed anew the importance of regeneration and/or conservancy of natural coastlines. The flooding that devastated nearby Long Beach on the south shore of Long Island, for example, would have been avoided or minimized had natural sand dunes still been in place that were removed early in the twentieth century to clear the way for apartments with oceanside frontage and the construction of a magnificent miles-long boardwalk promenade. This year’s fire to the south of New York City on New Jersey’s Atlantic shore owed its rapid spread to the very materials that give boardwalks their name: wood-plank paving. And, yet, boardwalks remain urban necessities. 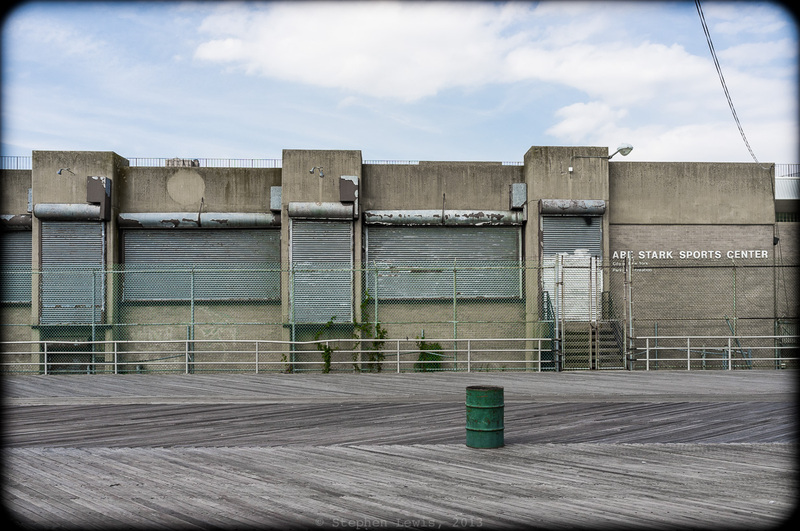 Shuttered monument to a forgotten Brooklyn politician: Abe Stark Sport Center, Boardwalk, Coney Island-Brighton Beach, 2011. (Fuji X100.) In the foreground: the characteristic herringbone wood planking of New York City boardwalks and a lone dented trash barrel painted in the signature green of the NYC Dept. of Parks. Boardwalks are products of the interstice of 19th-century romanticism and 19th-century urbanity, in which nature was a picturesque backdrop to be seen but not touched, to be witnessed — but with dry and unsoiled shoes — from the safety and elegance of seaside promenades and beach-front hotels and restaurants. In the context of the lives of millions of ordinary New Yorkers — this writer and two generations of his forebears included — the boardwalk at Coney Island was and remains central to urban survival. Like Manhattan’s Central Park and Brooklyn’s Prospect Park, the Coney Island boardwalk from Brighton Beach past Coney Island to Seagate gives New Yorkers who lack the means to vacation or to travel afar access to fresh air and a refuge from urban congestion and searing summer heat. The Coney Island boardwalk was built ninety years ago, a time when the farmlands of Brooklyn were being paved over en masse for the construction of seemingly endless expanses of working- and lower-middle-class apartments for immigrants and their children fleeing cramped, degrading housing conditions in lower Manhattan. Their flight followed the paths of newly built subways lines, trajectories that gave also gave shape to the schemes of real estate speculators. The continuation of subway lines to the seaside, and thus to Coney Island, afforded the urban working poor an easy outlet to the beach and to walks and leisurely socializing on surfaces less oppressive than urban concrete, and to sounds less intrusive than the ever-present rattling of horse carts and, later, the roar of automobiles. Over the last century, usage of the Coney Island boardwalk has fluctuated in parallel with the fortunes and changing demographics of its immediate hinterland. (A lengthy subject that I will save for future posts.) The apogee of the boardwalk’s crowds and popularity was in the 1930s and early 1940s. A decline set in after the Second World War and continued through 1970s. A revival was sparked in the late-1970s, in part by the settlement in Brighton Beach of tens of thousands of mostly Jewish immigrants from the Soviet Union. 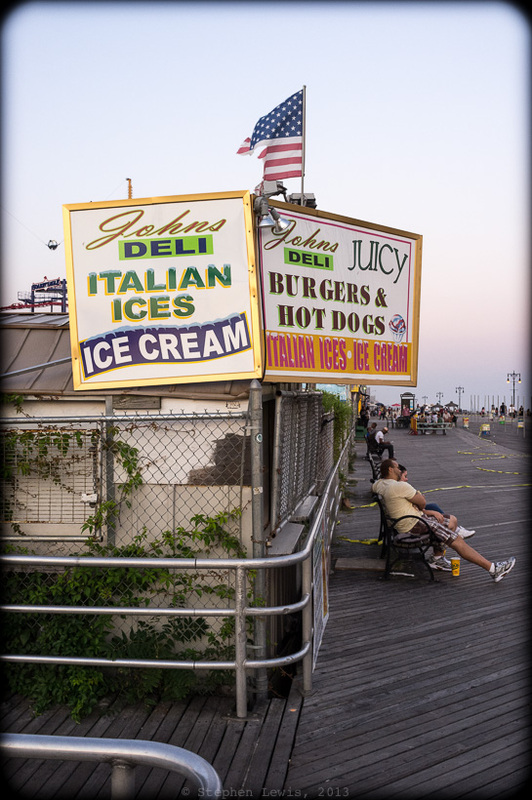 Over the past decades, the faces seen, and accents and languages heard, along the boardwalk have changed from those of Jews, Irish, and Italians — once amongst the dominant ethnic groups in New York — to those of African-Americans, Puerto Ricans and Dominicans, Russians, Central Asians, Indians, Pakistanis, Mexicans, and Chinese. What has remained constant is the precarious place of boardwalk denizens towards the lower rungs of New York City’s housing and economy. During the 1930s and early-40s, under President Roosevelt’s New Deal and the mayor-ship of Fiorello LaGuardia, investment in and maintenance of public infrastructure, both physical and social, was seen as a core task of government – – a means for collectively facilitating the lives and advancement of all individuals comprising our society and, not least, ensuring social peace in the process. Parks, beaches, and boardwalks included, were parts of the mix. “Fast forward” to the years of New York as financial center and the Bloomberg years, the age of a real-estate-development-driven economy, increasing unequal distribution of wealth, and “Manhattanization” (a new phrase coined to describe the phenomenon of a economically and demographically variegated city or part thereof suddenly turning into a preserve of those at the upper income levels, this a la the fate of much of Manhattan since the start of the millennium). Over the last decade, social and physical infrastructure and their maintenance are increasingly surrendered to private enterprises or left to the serendipitous voluntarism of “public private partnerships.” One of the results has been the filleting of the public funds for parks maintenance and the establishment in place thereof of “public-private partnerships” in the form of “conservancies” linked to individual properties. The outcome has been predictable. Manhattan’s Central Park, the city’s highest profile park facility, flanked by three of New York’s wealthiest district is governed and funded by a conservation with an immense endowment and budget. Brooklyn’s Prospect Park Conservancy struggles to cover costs and many of the parks facilities still dependent on filleted public funds languish. Wood paved boardwalks splinter, warp, and rot, they are maintenance intensive and require periodic resurfacing. In the spirit of Marie Antoinette advising the bread-starved poor of pre-revolutionary Paris “… let them eat cake,” the Bloomberg era’s prescription for the patrons of the Brighton Beach-Coney Island boardwalk appeared to be: “… let them walk on concrete.” A couple of years ago, large sections of the boardwalk surface were stripped of their wood and replaced by prefabricated modular sections of light-colored concrete with surfaces crudely textured to give the impression of wood grain. The modular sections were poorly leveled and sloppily abutted. The immediate reaction? Small crowds of boardwalk denizens gathered in amazement and grumbled their shock and disapproval in, amongst other languages, English, Spanish, Turkish, Urdu, and Haitian Creole French. One hot summer afternoon soon thereafter I took an hours-long, high-speed walk the full length of the boardwalk, transitioning from flexible wood to skeleton- and joint-shocking concrete. Worse, the in contrast to the weathered medium-gray color of the wooden sections, the concrete sections were off-white beige that reflected heat and light upwards creating an searing oven-like effect. The removed wood-planks, by the way, were auctioned off to private buyers. Tekserve, the excellent Manhattan retail distributor of Apple computer products, for example, refurnished their 23rd St. retail emporium with salvaged Coney Island boardwalk planks. The official rationale for the proposed replacement of wood with concrete was two-fold. First, concrete surfacing costs far less than wood and requires only a fraction of the maintenance costs that wood requires. Second, the city government played the ecological card, mooting that the tropical wood required for outdoor paving comes from Brazilian rain forests but failing to add that the actual source was from managed, culled forests planted for purposes of reforestation. Not surprisingly, the use of tropical wood-fittings on parts of Manhattan’s circumferential Greenway along the east and west sides of lower Manhattan invites less municipal outcry about costs. What is fitting for the hands of the upper income strata, it seems, is far less appropriate for the feet of those at the lower end. Over the last few years, I have been doing a fair amount of research on the social origins and pay-offs of infrastructural investments. I first delved into this long ago while completing on an MA in urban affairs and public policy and continued during a decade consulting on the promotion of urban and regional economies the economic impact of industrial projects. I picked up the subject again during an 18-month, grant-supported sabbatical documenting and extrapolating implications from the remains of the architectural and infrastructural patrimony of the Ottoman Empire in southeast Europe. From 2009-2012, I worked as a periodic consultant to an agency of the European Commission charged with the financing and monitoring of most major infrastructural projects in Europe and adjacent countries. Relevant to the present blog-post, in 2012 I worked as a consulting writer on a (successful) proposal to establish a conservancy for the regeneration and conservation of the remain natural areas under the aegis of the City of New York. I am old enough to have witnessed the transition of New York City from a near-social democracy to a “throw-‘em-to-the-wolves” neo-liberal type environment. During the first two-thirds of the twentieth century, New York City built a free university system, a free hospital system, and one of the world’s preeminent public library systems. Housing and public transportation were kept affordable under the premise that these were infrastructural elements that facilitated the city’s economy and served the public good. This broad definition of infrastructure eroded during the last third of the twentieth century. In the twenty-first century, it has been hacked away further by the Bloomberg administration. At the same time that New York’s financial community feeds on socialism-for-the-rich bail-outs, the wealthy of the world flock to Manhattan, the incomes and cash reserves of most New Yorkers declines, large numbers of libraries, schools, and firehouses are closed, public transit fares raised, and little if anything is done to ensure the availability affordable housing for those who begin life in the lower income rungs and who spend their lives doing the literal and figurative “heavy lifting” that serves the city’s economy. Decades ago, many lower middle and working class New Yorkers, my own maternal grandparents included, spent their one- or two-week summer vacations in furnished rooms or ramshackle bungalows in Coney Island and the Rockaways. A memory of my childhood that still makes me wince is the phantom pain of the daily ritual of extracting splinters of boardwalk planking from the soles of my feet is the the end of each otherwise wonderful summer day of running about barefoot on the sand and boardwalk. Despite my predilection for natural landscapes, I hope that future generations of New Yorker children may enjoy similar days and surfaces… albeit without the splinters! Circumstances of work and life kept me away from the boardwalk this past summer. Next month I hope to enjoy wintry walks along the boardwalk between Brighton Beach, Coney Island and Seagate. I look forward with suspense to discovering the state of the boardwalk as repaired post-Hurricane-Sandy.